The continuation of our journey between Chicago and DC. First part is here. High on a hill above Charlottesville, Virginia our third President lived a pretty sweet life. Thomas Jefferson was a true renaissance man, studying languages, architecture, engineering, geography, botany and basically any subject that interested him. 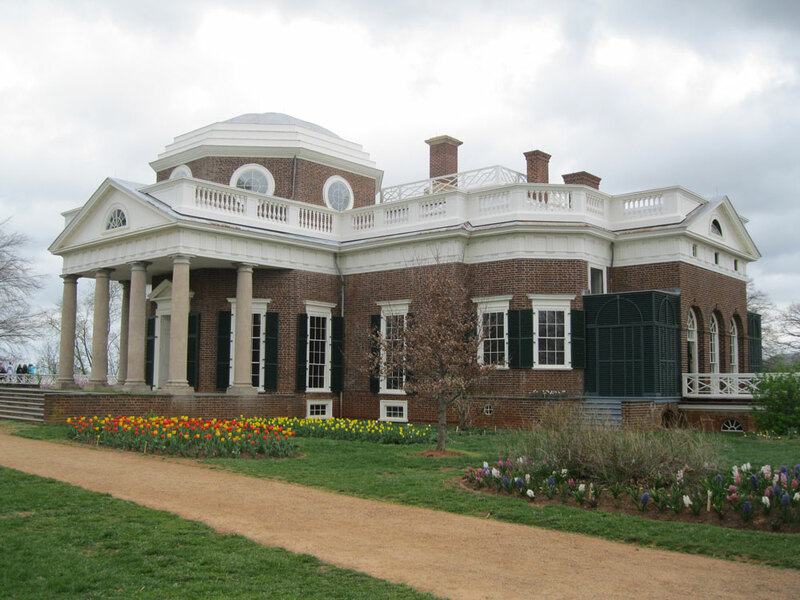 His home, Monticello, was his masterpiece of neoclassical-inspired American architecture where he integrated his own clever design solutions for things like keeping time, opening doors and discreetly replenishing wine in his dining room (spoiler alert: there were slaves in the basement loading a wine elevator). A ticket buys you admission to the house and grounds for a full day, with a specific time allotted for your guided tour. A museum at the visitor center has displays explaining Jefferson’s life, presidency and house. A shuttle bus then takes visitors to the top of the hill where tours of the grounds and slave quarters are offered in addition to the house hour. Taking the experience full-circle, the Jefferson family cemetery is located a short walk downhill from the house. An interesting side trip we made is to stop by the University of Virginia campus to see more of Jefferson’s idyllic classical architecture on display and in use. This tiny town that began as the site of a simple river crossing probably has more history per square mile than almost any other place in the country. In the late 1700s the natural beauty of the area was already well known with Thomas Jefferson declaring the view “worthy of a journey across the Atlantic”. In 1794 President George Washington proposed the site as the location of a United States armory/arsenal because being inland from the coast gave it a natural protection from enemies. Most of the small weapons for the army were produced in Harpers Ferry. The huge amount of available water power from the Potomac and Shenandoah rivers transformed it into an industrial center. Then in 1833 the Chesapeake & Ohio Canal reached Harpers Ferry and a year later the B&O Railroad came through town, making it a major crossroads between Washington DC and points farther west. Another famous visitor was Meriwether Lewis, as the armory was where the guns for the Corps of Discovery were crafted. He also designed an iron-framed collapsible boat he planned to use when he arrived in the Rockies (it unfortunately was an epic fail). There is a series of Lewis sites marked by signs and linked by a trail including a replica of his boat frame on the site of the armory. Probably the single most prominent event that took place in Harpers Ferry was John Brown’s Raid. It was an attempt by the abolitionist to capture the arsenal’s weapons and start a slave revolt that would spread throughout the South. They succeeded in capturing some hostages and a few armory buildings, but word got out about the uprising and Brown and his men were surrounded and unable to complete their plan. In the end 9 people were killed and John Brown and some accomplices were tried and hanged in nearby Charles Town, WV. The raid is largely remembered as an early sign of the issues that led to the Civil War that began a couple years later. During the course of the Civil War, Harpers Ferry changed hands between Union and Confederacy at least 7 times. It was seen as a strategic location by both sides. As a result of this fighting, the armory was destroyed, bridges were blown up and the general population was repeatedly terrorized by one army or another passing through and making a mess. Industry recovered somewhat after the war, but the town’s prominence began to fade. Several damaging floods in the 19th and 20th centuries sealed the fate of Harpers Ferry and it went into major decline. 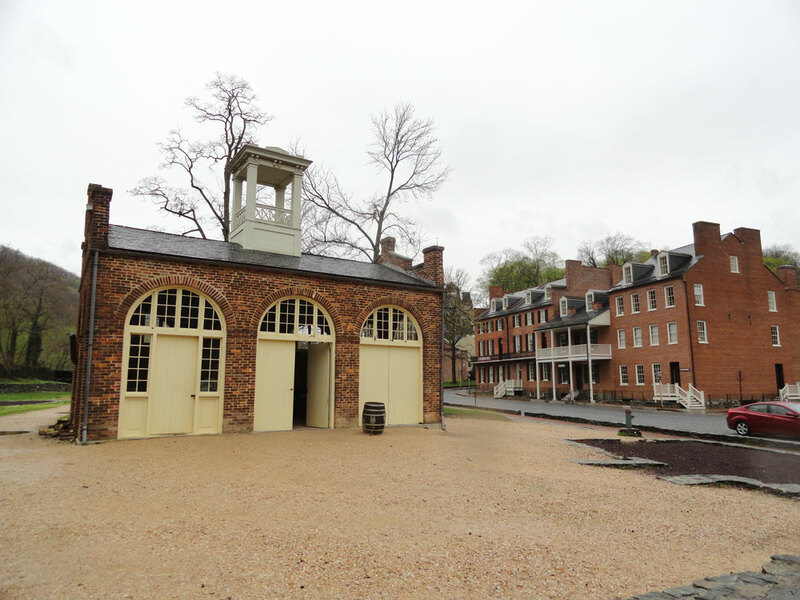 In the 1950s, preservationists realized what a special place it is and began to stabilize and restore many of the old buildings, ultimately creating Harpers Ferry National Historical Park. Many of the town’s buildings have been turned into small historical museums on a variety of relevant subjects. Another historic site is the campus of Storer College, which was one of the first racially integrated schools in the country. The Appalacian Trail Conservancy and Appalachian Trail Headquarters also call Harpers Ferry home. There you can learn about the trail and the mission of the Conservancy and flip through albums of Polaroids of hikers who pose for a photo as they pass through. 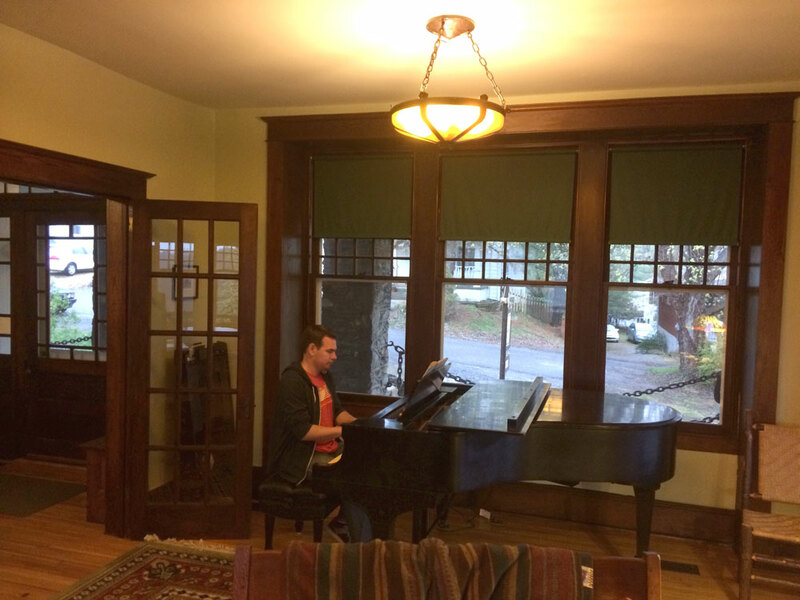 Nick trying out the baby grand in the living room. This B&B high on a bluff above the Potomac River turned out to be the perfect place from which to explore all this history. From the always-available coffee and cookies to the Steinway baby grand piano in the living room (which Nick made use of) to the fireplace, everything was inviting and comfortable. The innkeepers, Chris and Ed purchased the property in 2001 and have restored it to its 1915 appearance. The house itself has a quirky style as the original builder had an appreciation for artifacts. All over the house things like Civil War bayonets, bullets and belt buckles are embedded into stone and cement, it makes for an interesting self-guided treasure hunt. At breakfast in the morning we were served homemade coffee cake, fresh fruit and frittata. For entertainment, a bald eagle swooped and glided over the trees just outside the window while we ate. Overall the perfect place to stay in Harpers Ferry and one of our all-time favorite inns. This entry was posted in Destinations, Travel Tips and tagged Appalachian Trail, Chicago to Washington Road Trip, Harpers Ferry, Laurel Lodge, Monticello, Thomas Jefferson. Bookmark the permalink.